TNA: Trump Announces Formation of "Brownshirts for Trump"
NEW YORK CITY, NEW YORK (The Nil Admirari) - Today, Republican presidential candidate and billionaire Donald Trump announced the formation of "Brownshirts for Trump," an elite club for his most enthusiastic supporters. 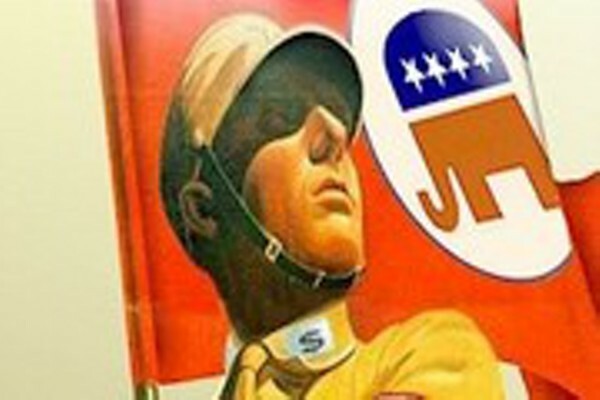 The Republican frontrunner explained members of the Brownshirts will wear brown shirts and engage in political outreach operations - mainly at night - to interact with non-Trump supporters, those with "anti-American political ideas," and "anyone who doesn't look American." "You know the fireman from Boston who beat up the homeless guy for ordering food too slowly a few days ago? He is already a Brownshirt, and his huge anger problems are going to hugely change the dialogue between my supporters and my not-so-great nonsupporters," explained Trump to a large crowd that booed at the word "nonsupporters" when the billionaire gave two thumbs down. Trump continued, "The more angry you are, the more effective you will be as a Brownshirt. And you'll just get so tired of winning over the people who don't support me, and don't support you, and who don't support America being great again. But, you'll see, we'll just keep on winning. My Brownshirts are going to bring my campaign to every street in America." "All you have to do to be a Brownshirts is sign-up at a Trump 2016 office in your neighborhood, answer some hugely awesome loyalty questions, and be apocalyptically and blindly angry at everyone and everything, except me. Those with a huge record of violence, and experience using blunt instruments are the ones I want," said Trump. "If you are Trump material we'll let you know the same day. You'll get your Brownshirts uniform, your first paycheck in advance for a week of political outreach operations, and be out on the streets that night to interact with people who hate me, hate you, and hate making America great again," stated Trump. Political observers marveled at Trump's ability to create so many jobs so quickly, but Trump ignored an unidentified member of the press when she asked if like-minded law enforcement officials were being allowed to join the Brownshirts in secret.